Tony award-winning 9/11 musical Come From Away has announced its UK premiere at the West End’s Phoenix Theatre. The musical is previewing from January 30, 2019, with press night on February 18. It has not been confirmed when the production is booking until. Come From Away will replace Chicago at the Phoenix Theatre, which recently announced a new booking period until January 5, 2019. 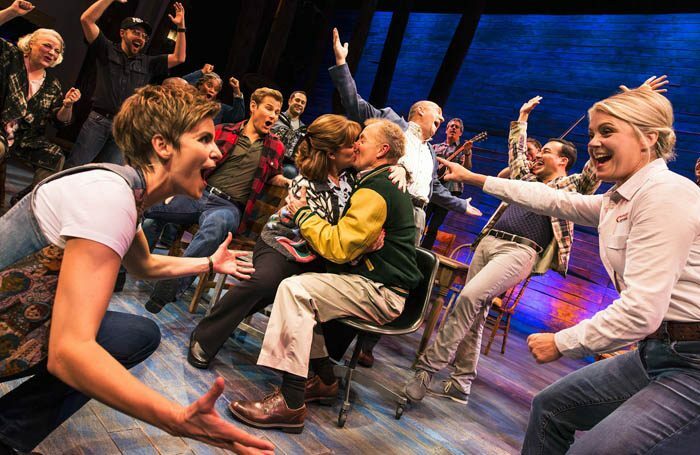 Prior to the West End run, Come From Away will have a limited engagement at the Abbey Theatre in Dublin from December 6 to January 19, 2019. The musical is based on the true story of a small town in Canada that welcomed 7,000 air passengers who were stranded in the wake of the 9/11 terrorist attacks. Come From Away features a book, music and lyrics by Irene Sankoff and David Hein and is directed by Christopher Ashley, with musical staging by Kelly Devine and musical supervision and arrangements by Ian Eisendrath. Set design is by Beowulf Boritt, costume by Toni-Leslie James, lighting by Howell Binkley and sound by Gareth Owen. Come From Away is produced in the UK and Ireland by Junkyard Dog Productions and Smith and Brant Theatricals. Casting is to be announced.